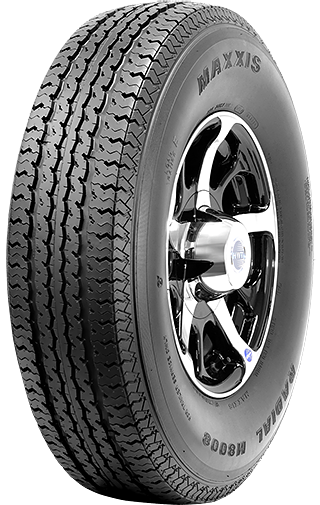 These tires qualify for our flat rate shipping , but express shipping is not available. 1) Tire Age - If you store the trailer outside, no matter the mileage, the tires seem to only last 3 or so years before you have trouble. 2) Tire Pressure - We run our tires at max pressure plus 5-10psi. Remember that if you have a typical 24' enclosed race car trailer that has 7k lbs of capacity, the trailer itself weighs at least 3,000#. Add the car and "stuff" and you are easily running at 90% or more of rated tire capacity. We also recommend having your installer put metal or high pressure stems in the wheels to handle this pressure. 3) Speed - Remember, trailer tires are typically speed rated to 75mph. We are all racers and have a habit of running down the road at close to or over the limit. 90% load, 100% speed = lower tire life. -Rim is for display purposes only and does not come with the tire. -Excellent shock absorption while providing superior load-handling performance.